>> Need an Amish Friendship Bread Primer with the ten day instructions? Go here! I love it when members of our Friendship Bread Kitchen community share their Amish Friendship Bread recipes. This one by Cynthia Nussbaum of Rittman, OH is one of our all-time favorites. Think cinnamon. Think warm and soft Amish Friendship Bread bread dough. Think vanilla glaze drizzled liberally. And then some. Combine yeast, starter and water in mixing bowl. Let mixture stand for 5 minutes. Add flour, salt, butter and egg and mix together using the dough hook on low speed until dough forms. Once dough begins to form (flour may be in bottom of bowl), increase the speed to medium and knead for 4 minutes. Dough will cling to dough hook; clean the sides of bowl during this time. Remove dough from bowl; the dough will be soft but not sticky. Let it rise in a greased bowl in warm place for 1 1/2 hours. While the dough is rising, make the filling. Combine sugars and cinnamon thoroughly. Divide in half to use on each rectangle. Set aside with butter. Dough will have risen, but not doubled. Divide dough in half. Using very little flour (if any), pat or roll one half into a 12"x 9" rectangle. Spread a thin layer of softened butter over each rectangle. With a butter knife, score the rectangle into thirds horizontally on the 12" side (be sure not to cut through). Using one half of filling, spread an even layer in the middle section. Fold up bottom section over top of filling. Spread a thin layer of butter over this section, then spread filling evenly over top. Fold the top third over the filling and press lightly to seal. There may be small amount leftover after filling each rectangle. You should now have a long strip 12" x 3". Cut this in half. Then cut each half into fourths to make 8 pieces. Hold each strip at both ends and twist once in opposite directions. When twisting, some of the filling may come out, which is fine. Place each twist on greased baking sheet about 1" apart. Press both ends of twists to baking sheet. Repeat with remaining half of dough and remaining half of filling to make 8 more twists. Let rise at least 2 hours or up to 8 hours on the baking sheet, covered in a warm place. Bake at in a preheated oven at 375° F (190° C) for 12-15 minutes or until lightly browned. While the twists are baking, prepare the drizzle. Combine drizzle ingredients and mix well. Remove from oven and drizzle the icing while hot. From Cynthia Nussbaum: "The dough for this recipe is made using a stand mixer and a dough hook. I did not test it mixing or kneading by hand. It would need a longer mixing and kneading time if done exclusively by hand. This recipe can be started so that it is ready to bake when needed. I started this at night and let rise on the baking sheet until morning. In the morning, just pop it in the oven and bake. It'll be ready for breakfast or brunch!" From Cyndie Shumaker: "I didn’t have a dough hook so I kneaded by hand for 4 minutes. They turned out great. I made 12 from each rectangle instead of 8 and I like that size better." The cinnamon twists are super good. And my 15 year old daughter didnt have any troubles making these. Is there any way to freeze either the dough or the finished rolls? There’s just the two of us here, unless we have friends over to feed. These sound so yummy, but I’m afraid that it would be a waste if any of the bread were to go bad before having a chance to eat it all. Yes, it’s easy to freeze either, Christina, though I would recommend freezing the dough and bake as needed. Thanks! Today’s baking day, so I’ll give it a try. These didn’t turn out well for me. The dough was too stiff even though I didn’t add all of the flour called for. They were chewy and hard instead of soft and fluffy. Also, for me, the directions for the “twist” was difficult to follow. I might try these again with more water and less flour. I love anything with cinnamon! I’ll have to try these, they sound delicious! These look delicious! 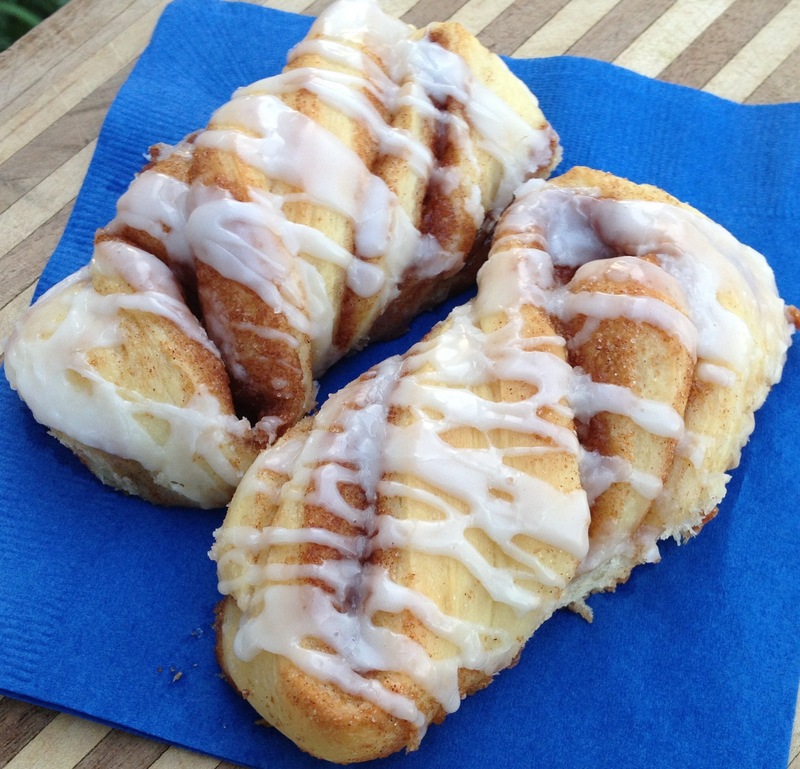 I make a Cinnamon Twist with a basic yeast sweet roll dough-so nice to have a recipe using Friendship Bread starter. Ooh, I can’t wait to have a bag ready to go – I definitely want to try this recipe! These look so yummy and so delicous. I can’t wait to make these and try these out. I love cinnamon rolls. I would love to win a copy of this cookbook to add to my collection. Always looking for good and newer recipes. I love to bake. I didn’t have a dough hook so I kneaded by hand for 4 minutes. They turned out great. I made 12 from each rectangle instead of 8 and I like that size better. Thanks, Cynthia. Thanks for sharing this, Cindie! We’ll add it as a Kitchen Tip from you — thank you! I don’t have a friendship bread starter, but I do have a sourdough starter… I am trying this out with my starter tonight. I guess I’ll know in the morning if it works out. Wish me luck!!! Hi Jodie! What went wrong? Remember that an Amish Friendship Bread starter has sugar, flour and milk whereas most sourdough starters have only flour and water. This recipe has worked well for us so maybe try it again with an Amish Friendship Bread starter if you have a chance? Also make sure your active yeast, baking soda and powder are fresh. Good luck next time! I’d make this recipe for my friends Cindy and Alice. They often host me when I’m working in their respective towns, so it’d be great to bring along breakfast. I would like to try this and share it with my husband and kids! I’ll have to try this when I get my starter going. I’d love to bake these for Mother’s Day. The first time I tried the recipe I must have made an error in making the dough as they did not really turn out that well. That being said, I have made these numerous times since then with excellent results. My family gobbles them up often before they have a chance to cool off so I have not had any that have made it to the glaze stage. Thanks for another great recipe! The ingredient list could use a breakdown. For example the butter – it says “1/2 cup butter” and “3 tablespoons for drizzle” however butter is called for the drizzle, filling, and drizzle. Not sure how much butter goes into the dough and how much goes into the dough while filling? Hi Tiffany. I’ve made this recipe many times, (making some now) and the website has changed since I first found it & the spacing is wrong. “For the filling” and “For the drizzle” should actually be a space down as a heading for the next few ingredients. So, no egg in the filling and no butter in the drizzle. I hope that helps! If I mix these up at night can I put them in the refrigerator to raise the 8 hrs. Concerned that letting them raise that long not refrigerated would be too long since most rolls would be ready to bake within an hr or so after the final raising. Hi Joyce! We haven’t tried letting these rise in the refrigerator, but it should be fine. If you take them out of the fridge and they don’t appear to have risen, let them come back up to room temperature before baking.